Some years ago, I had the chance to visit Le Corbusier's works done between 1959-1968 at Firminy: the Maison de la Culture, the stadium, the recently completed church - and his Unité d'Habitation. I will publish some of my pics one day. 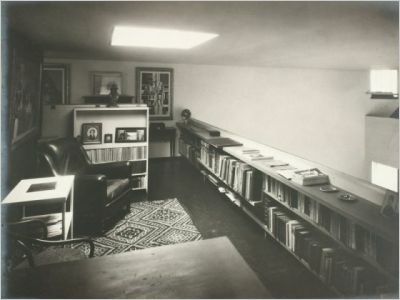 The World Of Interiors [jan 2011] gives us the chance to see more of his earlier projects in Paris and vicinity: Maison LaRoche-Jeanneret (1923-25), designed by Corbu. Enjoy the sculptural forms, playing with light, framing and especially COLOUR! Buildings or sculptures; paintings or rooms/spaces; are they spaces meant for living or observing? Maison LaRoche, interior restored 2009 by Agence Pierre-Antoine Gatier. Note gray color of radiators; this is the original color as determined by paint analysis. To see how and where, visit the Fondation Corbusier.